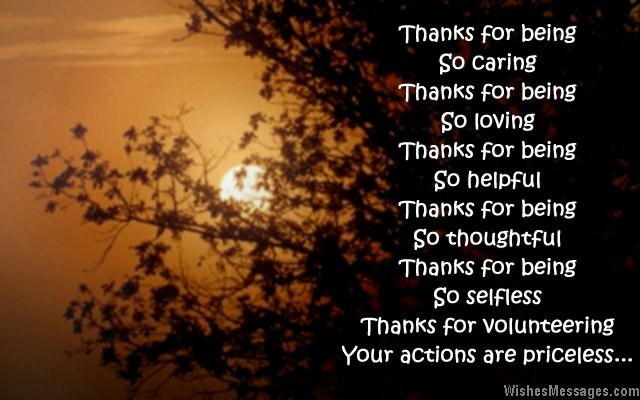 Thank You Messages for Volunteers: This post is all about showing appreciation to the people who love to contribute to causes – whether it is for the homeless, elderly, animals, poor, orphans, addicts or something else. Volunteers have hearts of gold and volunteering takes a sheer selfless sense of wanting to give back to the community. Their devotion and commitment needs to be acknowledged, in expression if not in kind. A sweet thank you note or an inspirational quote scribbled on a handmade greeting card will go a long way in making a volunteer feel appreciated. 1) For some people, volunteering is about giving. But for the likes of you, it is a way of living. Thanks. 2) Wages in the form of love, perks in the form of hopes and promotions in the forms of blessings – this is your reward for volunteering with all your heart. Thanks. 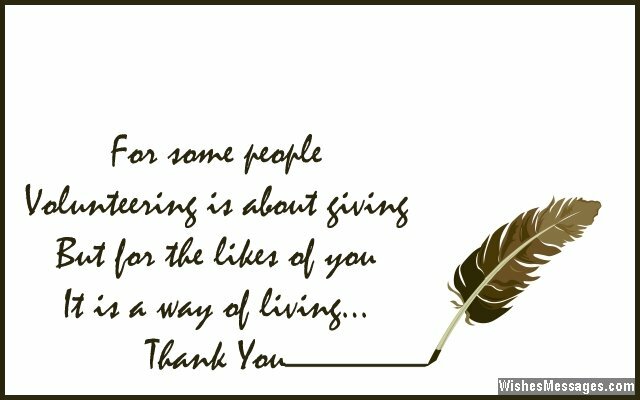 3) You are proof that volunteers are people who don’t want to be thanked for helping others, but want to thank others for giving them the opportunity to help. God bless you. 4) You may not realize this but you are the real life Superman in the lives of all the people you have helped. Thanks for volunteering. 5) The wealth of love that you have amassed by volunteering will pay interest in the form of happiness for the rest of your life. Thanks. 6) The youth is doing everything it can to be different, but few are doing everything they can to make a difference. Thanks for volunteering. 7) If life was a Twitter page, #kindness, #benevolence and #compassion would be trending because of you. Thanks for volunteering. 8) By choosing to work for us without a fee, you have proven that your time and talents are priceless. Thanks for volunteering . 9) You are a master of disguise – an angel on earth who no one can recognize. Thanks. 10) By volunteering you have just given the most expensive and priceless gift anyone could have ever given – kindness and love. Thank you. 11) Most people just share quotes about kindness and generosity on Facebook. Thanks for walking the talk. 12) Your volunteer work has not given you dollar bills, but you have already gathered a lot of love and goodwill. Thanks for your help. 13) Your acts of kindness are small, but the impact they will leave in the world will be is huge. Thanks for volunteering. 14) Great volunteers like you never want anything in return, but are always ready to do great things out of turn. Thanks for volunteering. 15) In the day and age where greed is making everyone focus on getting and receiving, few angels like you are still committed to giving and helping. Thanks. 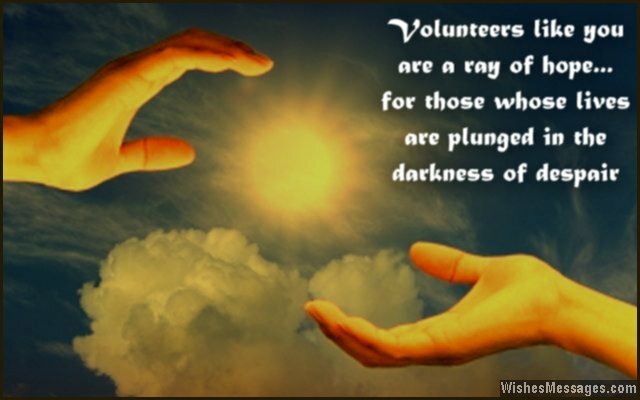 16) Volunteers like you are a ray of hope for those whose lives are plunged in the darkness of despair. Thanks. 17) If the world becomes a better place tomorrow, it will happen because of volunteers like you. Thanks. 18) Volunteering will not make you a millionaire money-wise, but it will make you a billionaire blessings-wise. Thanks. 19) Volunteers like you should take birth in this world by the dozen, for your kindness makes you one in a million. Thanks. 20) Hope for mankind’s brighter future lies in selfless acts of giving and volunteering… like the ones done by you. Thank you. 21) Everyone leaves behind footprints in the sands of time, but your footprints will be engraved on stone for future generations to follow. Thanks for volunteering. 22) You won’t look back on your laurels as much as the happy memories you created while helping others. Thanks for volunteering. 23) Real life lessons don’t lie in books, but in working with selfless people like you. Thanks for volunteering. 24) The size of your heart and will to help, is more important than the size of your wallet. Thanks for volunteering. 25) Volunteering is one of the few jobs in the world which will reap rewards until you die – in the form of blessings. Thanks. 26) Thanks for volunteering and giving our organization the most precious thing you will ever own – your time and talent. 27) Thanks for helping us make a difference. People like you should volunteer in abundance. 28) What goes around, comes around… and going by the kind of effort you are putting in to volunteer, life is set to give you the sweetest rewards. Thank you. 29) Versatile, Optimistic, Lovable, Understanding, Nice, Talented, Energetic, Enthusiastic, Resilient – that is the kind of amazing VOLUNTEER that you are. Thanks. 30) Volunteers like you are soldiers of an imaginary army secretly joining hands to make the world a better place. Thanks. 31) Thanks for being so caring, thanks for being so loving. Thanks for being so helpful, thanks for being so thoughtful. Thanks for being so selfless, thanks for volunteering… your actions are priceless. 32) Volunteers like you prove that the only right way to live, is to constantly sacrifice and give. Thanks for volunteering. 33) The only way to become smarter, better, happier, livelier and wiser, is to help others – just like you have. Thanks a lot. 34) Every drop of your sweat will go towards building the foundation of someone else’s life. Thanks for working hard as a volunteer. 35) Even the biggest bank balances seem tiny when they are put up against a big heart like yours. Thanks for being a committed volunteer.